Low prices. OrangeSmile.com offers car hire service in Norway on the lowest-rate-guarantee basis, since we work with car suppliers directly. For your search criteria in Norway, we always select and show the best rental offers. The car reservation process consists of 3 simple steps: (1) search for available cars for your dates in Norway; (2) select your car type; and (3) fill in the booking forms. Once the reservation is completed, you will receive a confirmation voucher to your email address. During the booking process, please check your rental conditions. To pick up your car at the rental point in Norway, you need to provide our confirmation voucher, your driving license and a valid credit card. The final payment is normally carried out at the pick-up point. Our car hire points in Norway accept VISA, MasterCard, etc - please check your rental conditions. At the pick-up point, please read the handling manual and check the car for present defects. OrangeSmile.com wishes you a pleasant journey to Norway! The car hire reservation system OrangeSmile.com allows renting a vehicle in Norway within 10 minutes. Our largest database of car suppliers enables us to provide you a rental car in Norway at the cheapest rate ever possible. At rental locations in Norway we offer the following car sizes: mini, compact, economy, standard, premium and luxury. The following car types are available in Norway: Sedan, Hatchback, Jeep, Cabriolet, Coupe, Minivan and Minibus. It's simply impossible to mention all landmarks and places of interest in Norway as absolutely every part of this country is rich in natural and historic places of interest. 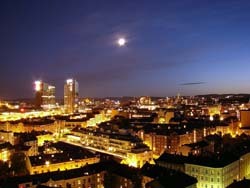 The capital of the country, Oslo, is a must visit destination and a great place to start exploration of the country. There are several historic buildings in the central part of Oslo. The capital has a great mix of new and old, and so old houses here border with modern skyscrapers. The majority of historic buildings have been transformed into museums and exhibition halls. The capital is a perfect destination for unhurried walks; travelers will find here several theatres, large trading centres and restaurants. The city of Bergen will be even more interesting in terms of the number of excursions. The famous Hanseatic waterfront is considered the heart of the city. Bergenhus Fortress, the building of which took place in the middle of the 13th century, is a no less interesting destination. There is one more interesting landmark near the fortress - Rosenkrantz Tower - that was built three centuries later. The fish market is also a prominent place in the city. It has worked on one of the city's squares for more than 700 years. Art connoisseurs are recommended to visit the Museum of Art, where they will be able to see works of Picasso, Munk and Miro. On the shore of a lake one can see a beautiful building - a mansion of Edvard Grieg, better known under the name Troldhaugen. The region of Finnmark is a true paradise for fishermen and hunters. Its fjords are full of different species of fish, and its dense forests have become home for numerous animals and birds. There are several nature reserves here, with Øvre Anárjohka National Park being the most famous one. Tourists are welcome to participate in boat and ship rides, during which they will be able to see the beauty of the coast. Foodies are recommended to visit city of Tromso, where they will find numerous restaurants, taverns and bars. The majority of them specialize in making traditional Norwegian food, so they're the best place to eat delicious fish and drink some of the best wine in the country. Nordland is a small town that is mostly famous for its magnificent waterfalls and mysterious caves. Travelers come to the town to see ancient drawings on the rock that belong to the prehistoric times. Trøndelag is a beautiful town that is famous for its medieval buildings - the Palace of Archbishop, St. Clement's Cathedral, Rein Abbey and Helge Farm. These are just a few famous landmarks that should be included in the excursion program of every traveler. Nowadays, car rental areas in Norway are often located outside airport terminals. In this case just take a free-of-charge bus from the airport to the rental area.